Le Mans or bust - Follow that cab! » Blog Archive » Whats that noise? « Back on the road again. 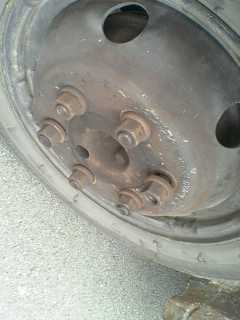 The reason for the noise on the last 50 miles into Calais. Several slightly loose wheel nuts. This entry was posted on Monday, June 19th, 2006 at 6:05 pm	and is filed under Mobile updates. Don’t forget that if you are looking for evidence of the fault line from the the prophet Elisha and the Witch of Endor, which came to England with the crusaders, and the church secret society, Agnus Dei tried to supress, them you should visit St Martin of Tours church, Guston. See the details on the web site on the Newsletter page. Oh! And by the way, just ask Orde about loose wheel nuts! Or maybe those germans in the truck got jealous and loosened them off ! Pass me the hammer, no the bigger one.